The tagline everyone remembers from Fallout is that opening quote uttered by Ron Perlman: "War. War never changes." Despite that line at the beginning of many Fallout titles, it's not true in terms of the series. Fallout has changed and shifted. Fallout 1 and 2 are isometric, dialogue-heavy role-playing games. Fallout 3 and 4 are first-person shooters with role-playing elements and some simple dialogue trees. And now we have Fallout 76, which moves the series from a single-player experience to a multiplayer one. Fallout is always changing. Just above 15 hours in, I can safely say that at times you can completely forget that you're playing an online-enabled Fallout. Exploring the decaying, forgotten remnants of civilization in West Virginia feels like it did in Fallout 3, Fallout: New Vegas, and Fallout 4. 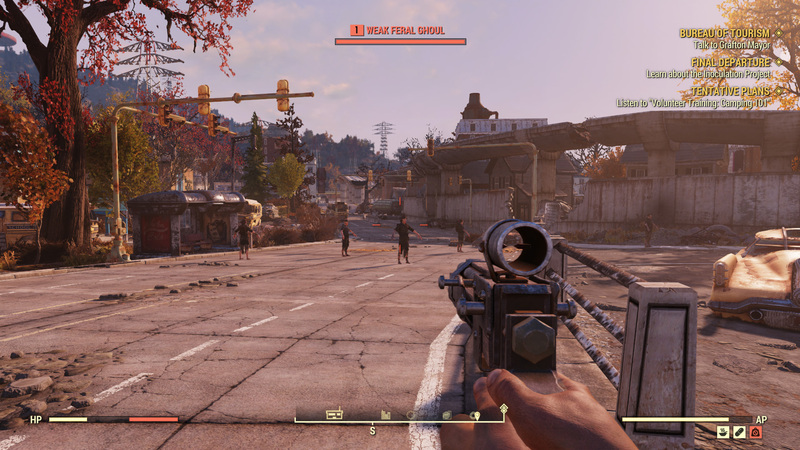 Bethesda has taken a look at the game's base-building mechanics, offering an improvement in the more mobile C.A.M.P system, rather than a set location for construction. 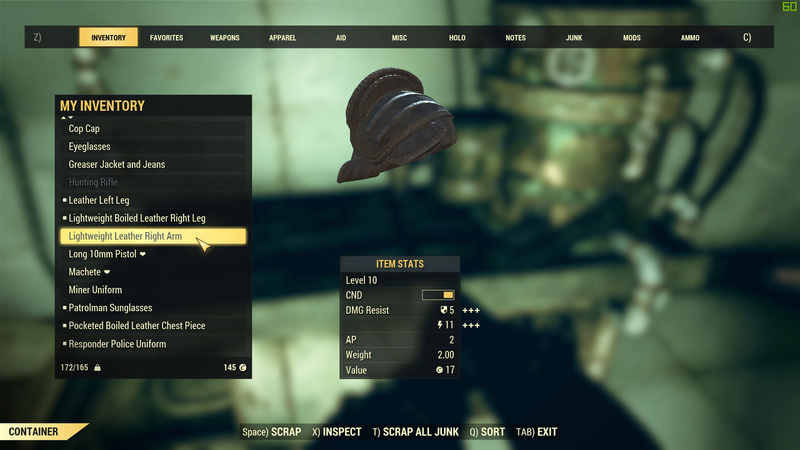 Fallout 76 still carries forward some of the issues with weight and inventory management that I had with Fallout 4. But when you're in a sub-basement shooting at ghouls, reading computer terminals, and taking everything that's not nailed down, those neurons forged in modern Fallout start firing. 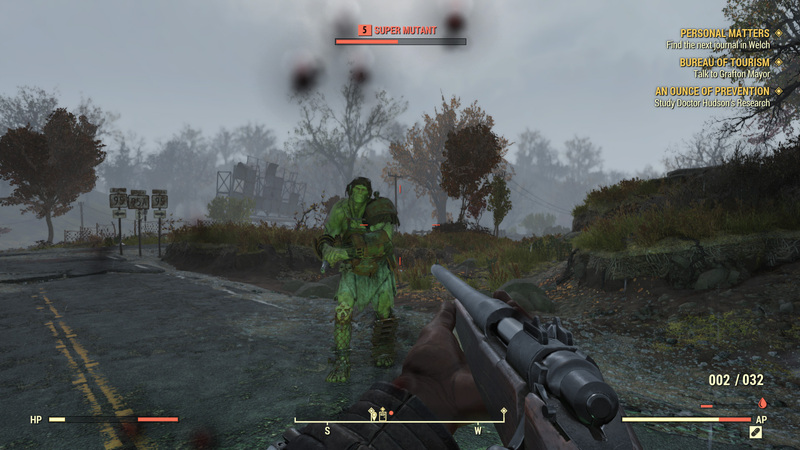 Like a lumbering super mutant, online play in Fallout 76 seeks to destroy some of the things you love about single-player Fallout. At its best, online play in Fallout 76 is multiple players working together to tackle a random event, or a team of friends diving into a derelict building together. It's not always at its best though. 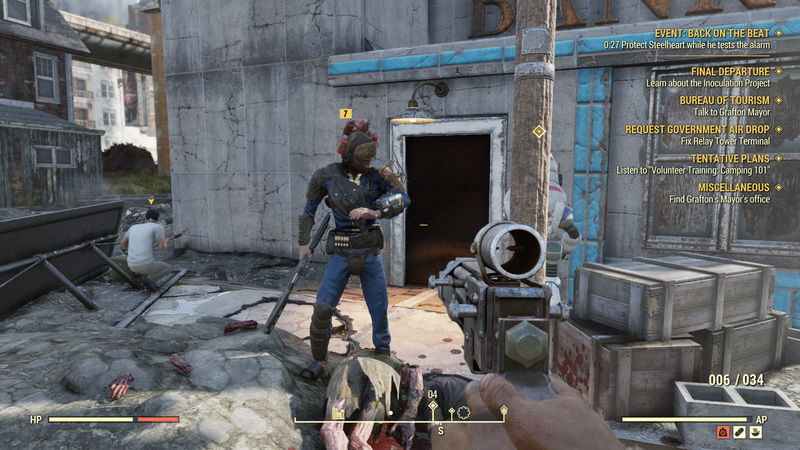 A few players in Fallout 76 sporting their own looks. One issue comes from general immersion. Fallout 76 starts with open mics active for all players. I was streaming some of my opening hours with the game yesterday, and had to shut down my microphone when I realized it was live. That meant everything I was saying to viewers on the stream was also being piped out into the world. And most people aren't cognizant enough to change their settings. 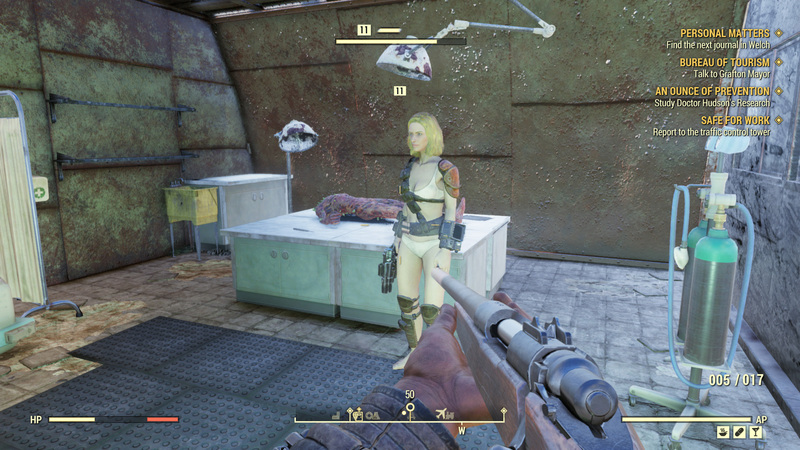 When I've run into other Vault 76ers, there's a wide variety of outcomes. Some don't talk at all, and don't interact; they're busy on their own missions. Others use the built-in emotes before going on their way. One guy followed me around for 10 minutes talking about the game before realizing that I wasn't going to provide anything to the conversation; I almost felt bad about that one. Some have been jabbering about nothing in particular while in earshot. And during the beta, I even had two folks shoot and kill me. The point is, you don't control the other people on your server, so you never really have any idea what you're going to get. There's no easy way to jump to another server, like you would in other online survival games ARK: Survival Evolved and Rust. Fallout 76 just drops you in a world at random, unless you join up with a friend. Fallout 76 would also benefit from a regional chat channel, which would help players form groups and gather people for events. (With a toggle, of course. I didn't need to see chat nonsense all the time.) 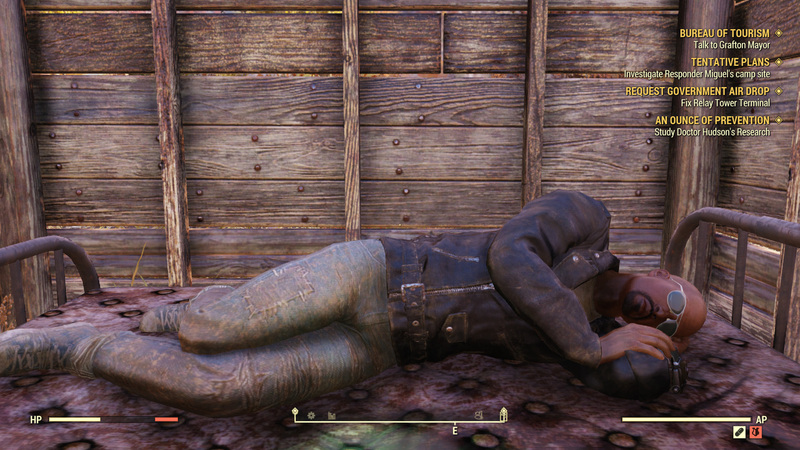 Fallout 76 has people that can annoy you, but it also feels rather lonely. Yeah, there are still bugs. The same is true of Fallout 76's handling of weight and inventory management. At its base level, Fallout 76 is a resource collection game like other survival titles. You're supposed to head out into a hostile environment with only a few tools, use those tools to explore, find useful resources, and improve your equipment. I like survival games. I've played Minecraft, Starbound, Terraria, Rust, ARK: Survival Evolved, both State of Decays, Don't Starve, Astroneer, and more, but I've never felt as constrained as I have in Fallout 76. But what if you don't want to scrap your loot? Well, there are more issues to contend with. In that case, you have to carry the items around in your inventory, taking up valuable weight until you reach a stash box. Every stash box in the world is connected to your personal stash. 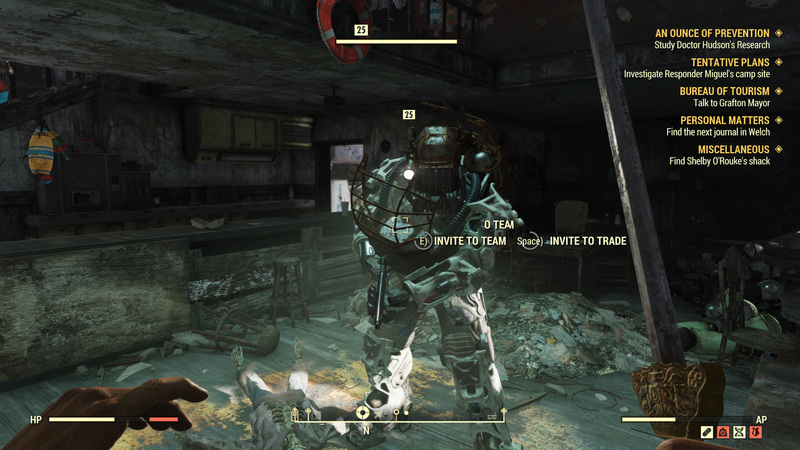 The problem is your stash has a maximum limit of 400 lbs, and you'll find that some of the better weapons (hello, power armor!) and your crafting materials will eat up that space quite quickly. There's no way to increase your stash size either. I added another stash box at my C.A.M.P., only to realize both boxes pointed to the same finite space. Visually, I'd say Fallout 76 looks pretty damned good. Stepping out of the Vault and looking down onto the valley below, with the bright reds and oranges of fall, is a stunning beginning. If you've played Fallout 4, you'll have a basic idea of what to expect here. Performance is still all over the place. 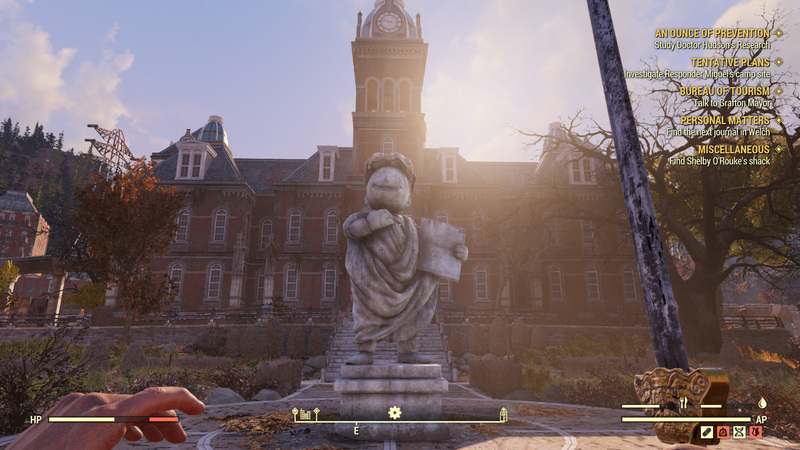 I'm running an Intel i7-4790 and Nvidia GTA 970; my rig runs Fallout 76 at respectable levels for the most part (45-60fps on average). I've tweaked the settings to offer more consistent frame rates, but the game will still dip hard when you're coming into town or fighting against some enemies. 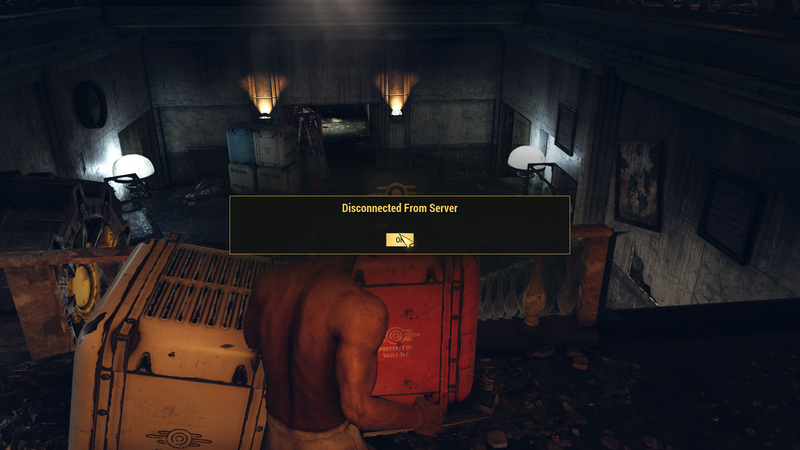 That's the kind of thing I'd hope Bethesda will improve with time, given that this is a service game. There's more I've experienced at this point, like my ongoing struggles with Fallout's base-building system, but I'll save some of those impressions for another update. 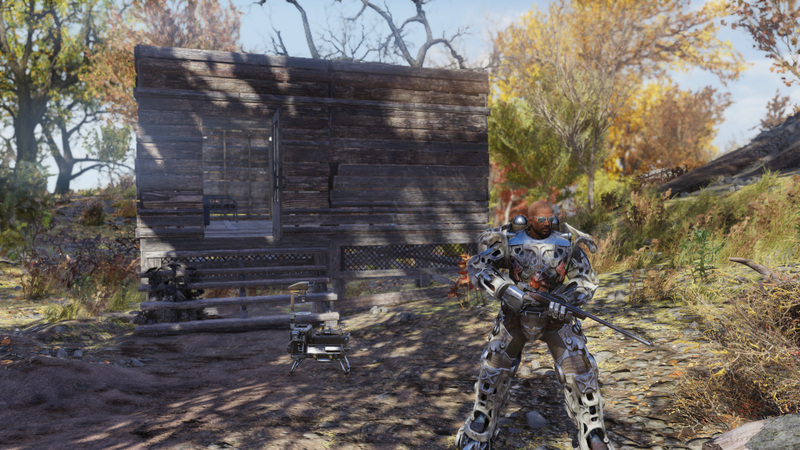 Right now, Fallout 76 feels like a game I can occasionally dive into and find that zen in looting and scrapping. That's what I play survival games for, that slow burn of reconstituting the world in your image. 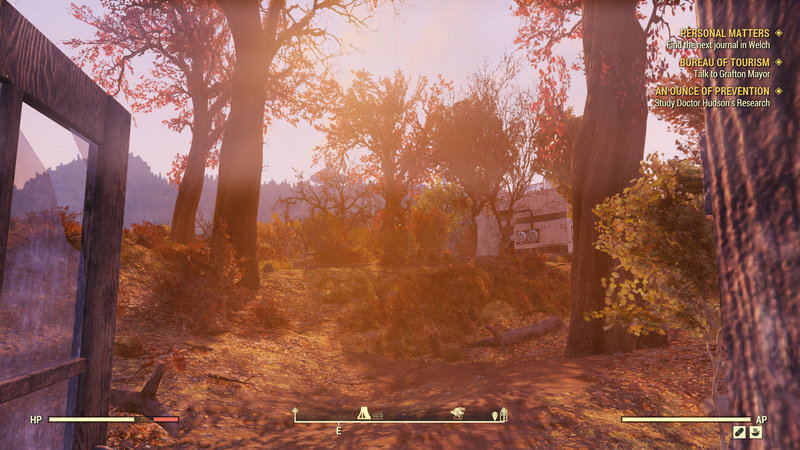 Fallout 76 isn't bereft of that feeling, but it also goes out of its way to put roadblocks in my way. Perhaps as I get farther in, those roadblocks will lessen. Tagged with Bethesda,	PC,	PlayStation 4,	Reviews,	Survival,	Xbox One.